This last weekend I made tamales in my dutch oven again. The last time I did this, they turned out great. This time, in the end, they also turned out well, but it was a kind of rocky road to get there. Makes about 20-25 tamales, approx 200 Cal each. 2 cups pork stock, also from the previous step. So, starting off with the pork. It's really pretty simple, I just added all of the ingredients in the middle of my dutch oven and roasted it. In this case, I put on about 26 coals, 13 on the bottom and 13 on the top, and roasted it to the right temperature, 160 F. Cooking it longer makes it come off the bone and come apart easier. Once it's all done, I pulled the meat out of the dutch oven. Then, using forks, I pulled it off the bone and pulled it apart into shreds. What's left in the dutch oven is very important stuff. Don't throw it away. Instead, I strained out all of the meat and spice particles and set aside the pork stock for the next day. I found there wasn't much fat to skim off, but if there had been I would have skimmed it. All of that stuff went into the fridge. The next day, I got started pretty early. I crushed up the chilis (anchos, I think) and soaked them for about 20 minutes to a half hour in some hot water. Once they were soft, I strained them off, and added them, with the cilantro and the garlic, to the stock. I put all of that into a blender and whirred it all up. Once that was all pureed, I strained it through a paper towel filter, so I just had the mash, and most of the runny liquid was drained. At this point, I cheated for those that may be purist dutch oven chefs. I did a little work on my stovetop inside. In my defense, however, I did use a cast iron skillet! I made a roux out of the oil and flour, and when that started to get a little bit past just tan, I added in the strained mush chile mix. I cooked that for just a little bit, until it really started smelling rich, and then mixed it up with the pulled pork from the previous day. I also poured some of the chile water that I had drained off back over the pork, and stirred it all up. That made the filling, and it went back into the fridge. Then, I turned my attention to the masa, the corn meal. This was pretty easy to make. I simply added all of the ingredients to a bowl and stirred it up using a pastry cutter. Done. You can adjust how moist it is by adding more corn meal or stock. Now came the rolling phase. I did this pretty much the same way as I did last time I made tamales. Here, you'll find the details of tamale rolling. A disclaimer, by the way: I'm not a mexican grandmother, and I've never seen one roll tamales, so I don't know if my method is "traditional" or "authentic". It worked, though. I put the veggie steamer into the 12" deep dutch oven, and unfolded it. 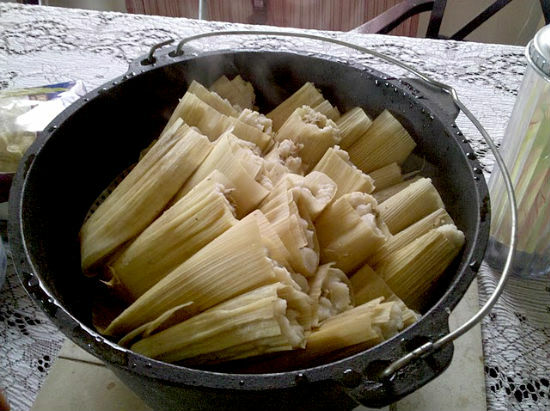 I added water up to the level of the steamer, and stacked the rolled tamales on the steamer. Then, it was out on the coals. I kept it to bottom heat, maybe 20 or so coals on the bottom. You're boiling it, so you'll want it to come to boil fairly quickly, then you can reduce the coals just to keep it simmering. You may need to add water from time to time, since the total cook time for me was almost two hours. I didn't really pay attention to that, and they ended up drying out. Not good. They still tasted good, though. Those look so good! I've been wanting to try those in my dutch oven too. You scooped me this time. I'm going to give this recipe a try.